Founded in 1939, the National Information Standards Organization (NISO) is the premier contact organization responsible for identifying, developing, maintaining, and publishing technical standards "to manage information in our changing and ever-more digital environment". Their standards apply to both traditional and new technologies to the full range of information needs, such as storage, metadata, and preservation, to name but a few. On their site, visitors can read their monthly newsletter, peruse their annual report, and take a look at their various standards, including those that are still being developed. 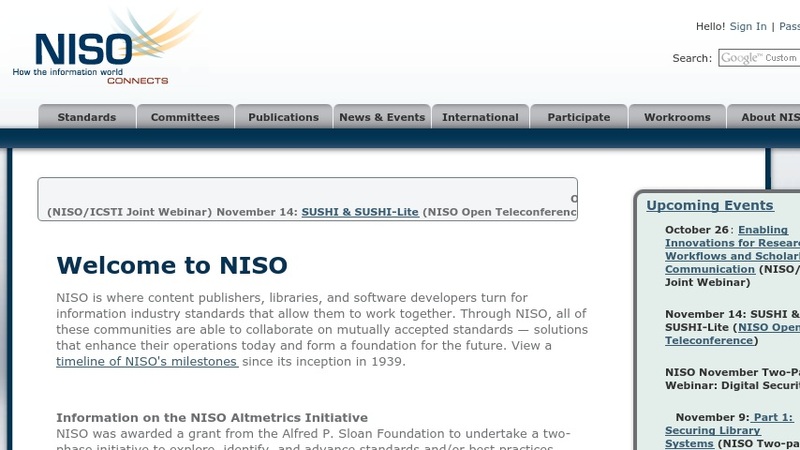 Visitors may also elect to download the current NISO standards if they so desire. The "Standards in Development" section is a nice place to take a look at, as it contains helpful notes and working documents on the development of such standards as technical metadata for digital still images and those for controlled vocabularies and thesauri.